There have been two extraordinary, original, innovative, character-driven thrillers released theatrically this year and Searching is one of them. The other is A Quiet Place which opened in April 2018 and garnered overwhelmingly positive reviews. Strong word-of-mouth catapulted the $17 million drama to a worldwide $332 million box office. If the movie gods are fair, Searching should equal A Quiet Place’s box office success. Searching’s difficult to write about as any detail of the story could lead to the unintentional reveal of a spoiler. What Searching is, without giving too much away, is the riveting tale of a dad, David Kim (John Cho), raising his daughter, Margot (Michelle La), by himself following the death of his wife. David’s a decent guy and a good dad, though it becomes obvious he hasn’t spent as much time listening to Margot as he should. Margot goes missing and David, understandably, initially believes she’s off with friends. It soon becomes evident it’s not simply the case of Margot forgetting to touch base with her dad and instead the 16-year-old high school student has truly disappeared. The police become involved and Detective Vick (Debra Messing) heads up what’s now a missing person’s case. David continues to do his own detective work and discovers his daughter’s world is nothing like he imagined. 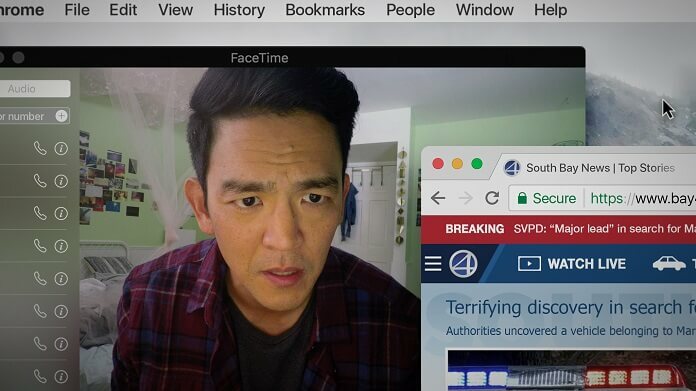 Written by first time feature filmmaker Aneesh Chaganty and Sev Ohanian, and directed by Chaganty, Searching is an engaging whodunit with twists that aren’t telegraphed in advance. It’s not often a film is able to take an audience completely by surprise, and judging by the reaction of the audience at the screening I attended, Chaganty’s rookie effort accomplished that. I’m not a fan of people who make noise during screenings, but watching Searching is such a collective experience the audience seemed to bond via simultaneous gasps and signals of encouragement unheard by John Cho playing a father terrified for his missing child. Cho delivers an incredible performance in a film that allows us into the story via the lenses of laptops, cell phones, and even the news cameras following the missing person’s story. David explores Margot’s world by delving into her social media, her texts, her emails, and videos. It’s striking how much he was unaware of leading up to her disappearance, and Cho’s performance makes us feel every ounce of pain, every bit of frustration, and even at times the anger he goes through as he frantically pieces together clues to his daughter’s whereabouts. Debra Messing, Michelle La, and Joseph Lee (as John Cho’s brother) are equally terrific in bringing this captivating story to life on the screen. Writer/director Aneesh Chaganty scores a knockout with his first feature and with Searching announces himself as a filmmaker to keep an eye on. An intense thriller that will keep you guessing to the end, Screen Gems’ Searching is a fresh, relevant take on the genre that pulls off telling a story in a new manner yet never stoops to gimmickry or tricks to enthrall the audience.